Sculptures based around exploring the form of Bonsai trees. BØN541 v3.0 is the third in my BØN541 series, exploring the form of bonsai trees, using recycled & salvaged materials. 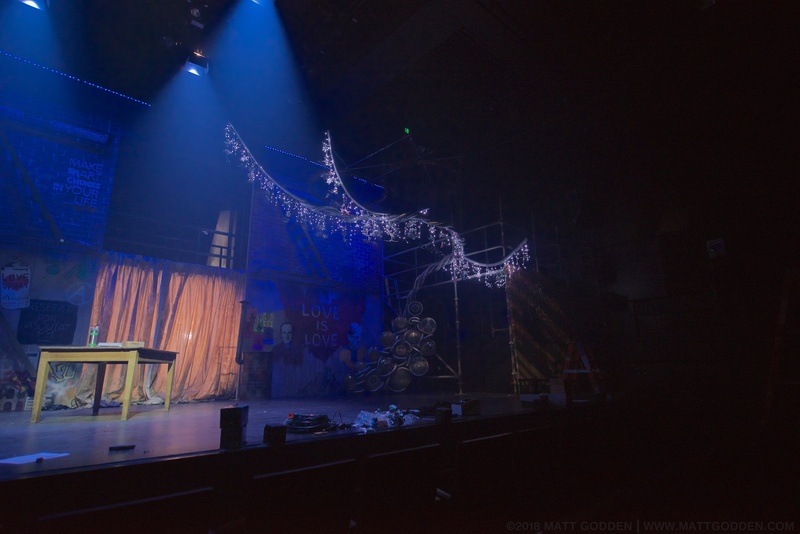 This work was created to be a setpiece for the 2018 staging of Rent, the musical, by Matt Ward Entertainment, at QPAC Brisbane. It is the largest work I’ve produced so far, and is constructed primarily from corrugated plastic water pipe, which is suspended using the truss and chain from my 2012 work Reconfigure. 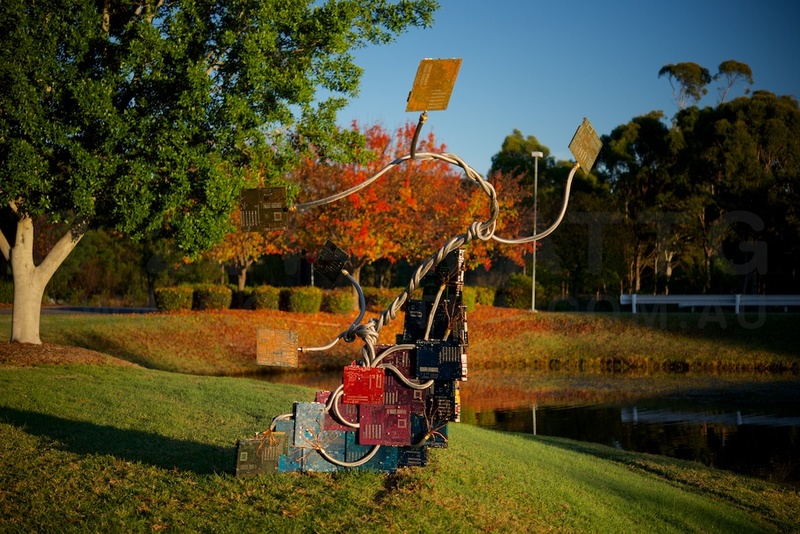 BØN541 v2.0 was created for the University of Western Sydney Sculpture Award & Exhibition 2014. It’s constructed from computer motherboards, and braided stainless steel hosepipe over a stainless steel armature. The work was supported with a material sponsorship by Convoluted Technology Pty Ltd, who supplied the braid. This work has since been disassembled, and its materials recovered. 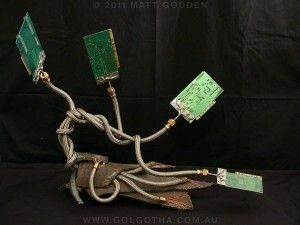 An attempt to capture the aesthetic of Bonsai, but using industrial / technological materials. It’s almost like some sort of weird cybernetic tubeworm colony. 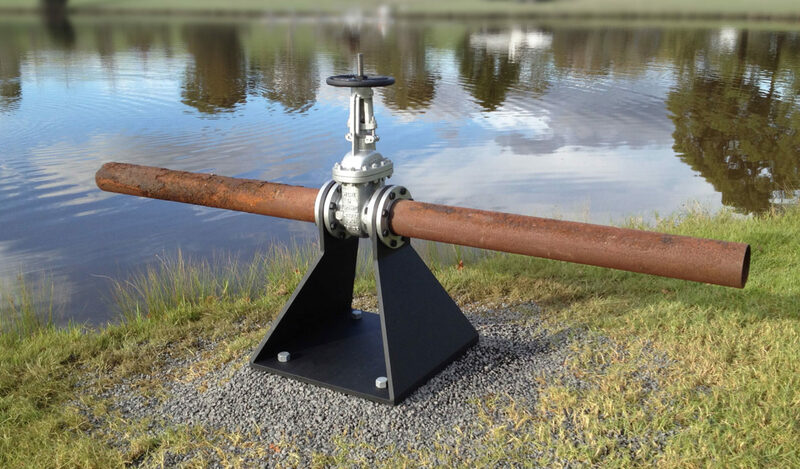 Stainless braid for this work was courtesy of Convoluted Technologies Pty Ltd. Raw steel, stainless steel, brass, copper, computer circuit boards. Dimensions h,w,d: 59, 70, 32 cm.